It’s 5:30am on Sunday, August 5, 2018. 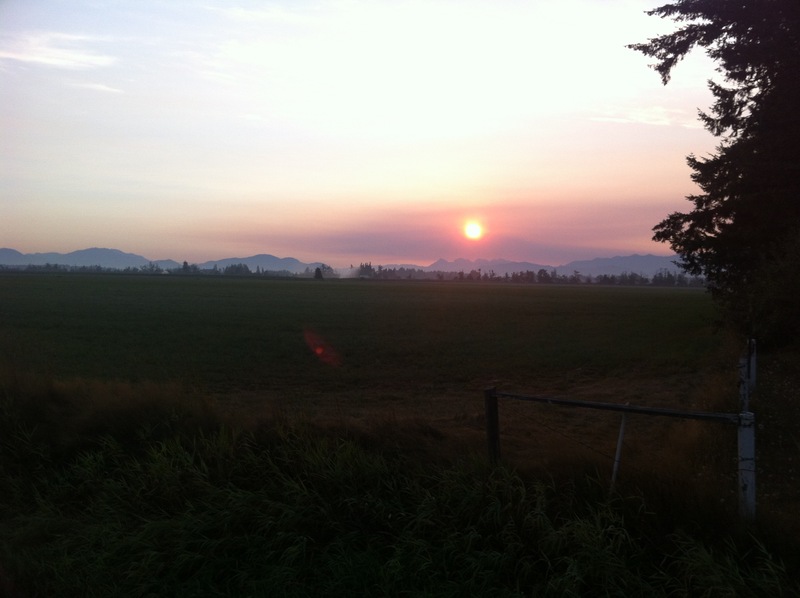 The sun has just appeared above the horizon, illuminating wisps of fog that drift across the pastoral farmlands of Lynden, Washington. Everything is still and peaceful—yet the parking lot outside Mom’s Bar & Grill is beginning to fill up. My friend and I join the dozens of activists gathered there, and are handed red bandanas with the words “Campesino Power” and “C2C” stenciled in white letters. We tie them around our necks, grateful for the extra warmth they provide in the chilly morning air. We are welcomed in a sunrise ceremony by Community to Community Development (C2C), who organized this March for Dignity to demand fair treatment of farm workers. “Thank you all for being here. We thought maybe ten people would show up this early,” C2C’s Civic Engagement Program Coordinator Edgar Franks says, to the applause of the large crowd. We hear from several other community leaders and take in the logistical information for this all-day march. We will be walking 12 miles, symbolizing the number of hours per day a farmworker is in the fields during peak season. Around 6am, we depart the parking lot. The march is led by several farmworkers, including Ramon Torres, the president of Familias Unidas por la Justicia, Washington state’s first indigenous-led farmworker union. Together, we march north, towards the U.S.-Canada border. There is no shoulder on this country road, so we walk single file in a narrow strip of dry grass between the white line at the edge of the pavement and a shallow ditch. Energy is high, and conversations sprout up all around us. My friend, noticing the slogans on some of the protest signs, asks about the H-2A guest worker visa program. As a participant in CAGJ’s Summer School, I recently learned about this program in detail; one of our readings outlined its intentions and flaws in a report titled, “Close to Slavery: Guestworker Programs in the U.S.” In brief, companies can apply to the U.S. Department of Labor to hire workers from other countries if they can’t find enough in the local labor force (a requirement that is often ignored). Often, H-2A workers come from Central or South America, and many of these are indigenous peoples who are already marginalized in their home countries. They come to the U.S. for a short period of time, usually during the growing season, and because their work visa is tied to a specific company, they can only work for that employer. If they lose that job, they must leave. Describing the H-2A program as “quasi-slave labor” is not an exaggeration. The system is set up to benefit the corporations needing the labor, leaving workers vulnerable to exploitation. Despite the protections that are provided on paper, in reality H-2A workers have very little recourse to complain about unfair labor conditions, wage theft, or the inadequate food and housing they so often are forced to endure. The companies hold their papers, so the workers live under constant threat of deportation. Worse, many are forced to pay large sums to recruiters in their home countries just for the chance to come to the U.S., and also accrue significant transportation costs that often are not reimbursed by their employer, leaving them trapped in a cycle of debt and constant exploitation. When I initially read all of this, I didn’t want to believe it was true. It can’t possibly be this bad… can it? Yes. It can. 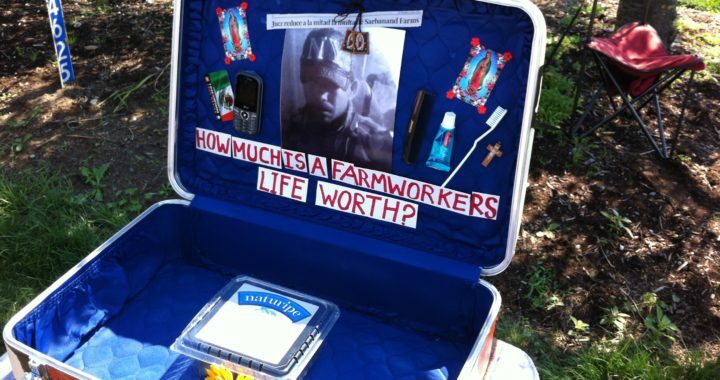 One year ago, Honesto Silva Ibarra, an H-2A farm worker, grew ill. He was told by his employer, Sarbanand Farms, that he’d be fired for abandoning work if he didn’t show up, so he had no choice but to continue picking, despite the summer heat and wildfire smoke that choked the fields. He collapsed and later died. Today, we are marching to honor his memory, on a route that will lead us to the blueberry fields in Sumas where he spent his final days. I think about all of this as we walk, as the sun rises and the temperature begins to climb. Most of the farms we pass are small and sleepy; the animals generally seem more interested in our procession than the farmers and landowners. Horses trot closer to examine us, then gallop away. Cows raise their heads and watch us pass. We skirt the border, separated from Canada by a ditch several feet wide. We march by acres and acres of tall cornstalks, and rows upon rows of blueberry bushes. It all seems so idyllic—but at a few farms, we are reminded of reality when we see workers picking in the fields or stationed atop mechanical harvesting machines. We wave enthusiastically, hoping they see us, hoping they know that we are here today to support them. By the time we reach our first stop, a raspberry field six miles from where we started, I’m grateful for the rest. My ankles are sore from walking on uneven ground, and I am suddenly ravenous. After waiting in the lengthy port-a-potty line, we sit down and refuel while listening to several speakers, including Jill Mangaliman, the Executive Director of Got Green. Soon enough, we’re back on the road again. The march organizers led us in various chants. “Se puede?” they ask. “Si se puede!” we chant in return. Yes, it can be done. Several people begin playing their bucket drums, and the percussion energizes us anew. I’m tired, yes, but also determined. I have never walked this long in a single day before. I want to make it to the end, though. The difficulty of this march, the length of it, is appropriate; it’s but a small taste of the physical hardships farm workers must endure every day. At the same time, though, it really isn’t comparable. After all, if I decide I’m done, I can just hail one of the shuttles and rest my weary feet while riding in comfort back to the parking lot. I can retreat to my family back at home and flop down on a couch drinking cool water; I can force myself not to think about what I now know about the H-2A program. Those options aren’t available to the workers who relentlessly toil in the fields so that I can sit on that couch eating perfect, unblemished berries. No. I will march on. This day isn’t about escaping discomfort. It’s about engaging with it. The miles pass, slowly. 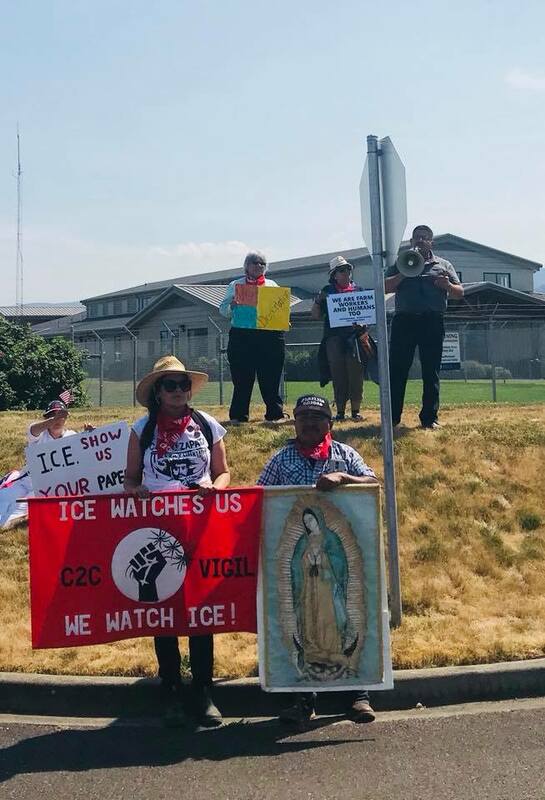 We stop again for a short rally at the detention center in Sumas, calling on ICE to end deportations. We hear several powerful speeches, including one from Jimmy Matta, the mayor of Burien, who is the son of migrant farm workers and is working to designate Burien as a sanctuary city. We sit in the shady grass, visiting with other friends who have joined the march along the way, eating fresh fruit and drinking water. It must be at least eighty degrees outside now. We have walked ten miles over the past 8+ hours. Jimmy Matta, the mayor of Burien, is the son of migrant farm workers and is working to designate Burien as a sanctuary city. I’m moving more slowly as we head back to the road, watching my feet as they pound into the dirt, kicking up dry dust. I wipe sweat from my forehead with my bandana. We pass the occasional sprinkler, and can’t resist veering closer to get misted with its spray. Eventually, we arrive in front of Sarbanand Farms. This 1500-acre blueberry farm is owned by Munger Brothers, a California-based corporation, whose berries are sold under the Naturipe brand. This is where Honesto Silva Ibarra worked until his untimely death last summer. After he passed away, dozens of his fellow workers spoke out about the extreme work conditions, the lack of adequate food, the unsanitary drinking water. They were then fired, leaving them in danger of being deported, and were forced to leave the labor camps on the property. Thanks to an upswelling of community support, they were able to stay temporarily on the property of a nearby supporter at what became known as Camp Zapata. But, one year later, there has been no justice for these fired workers. Although the company was fined by Washington State’s Department of Labor and Industries for violations of several laws regarding working conditions, it was not found negligent in Silva Ibarra’s death. By now, we are a crowd two hundred strong. We line both sides of the road in front of the farm. 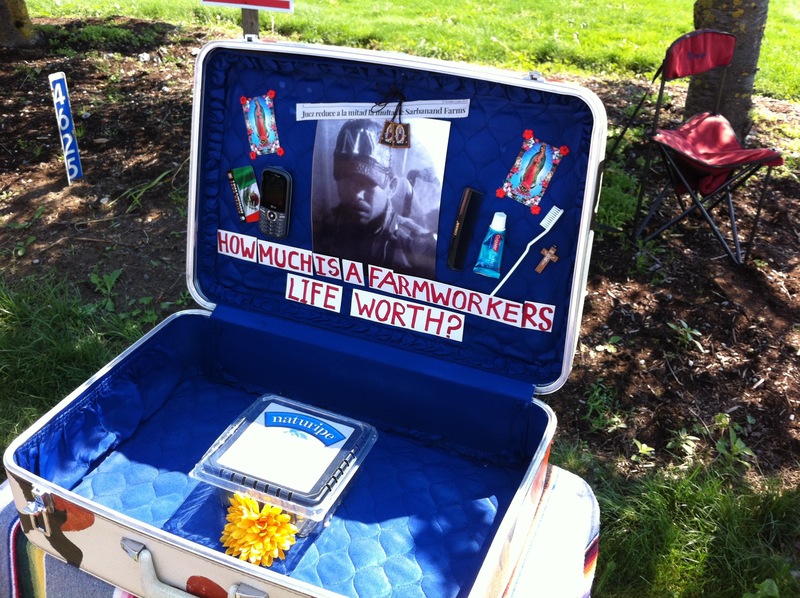 An open suitcase, featuring a photo of Silva Ibarra and filled with items symbolic of the hope that workers bring when they come to this country, is positioned near the road in front of the farm’s management offices. A few security guards watch us. Further back, two men from the company sit outside the offices in folding camp chairs, one of them a lawyer in a button-down shirt. They watch as we hold a People’s Tribunal to hold the company accountable for their mistreatment of workers. Several people who witnessed the events of the previous summer step forward to give emotional testimony. In the end, the tribunal finds Sarbanand Farms guilty. Even though the company’s spectators don’t engage with us or speak in their defense, our huge display of support for workers sends them a powerful message. We are still watching. We will not forget what happened here. A tribute to Honesto Silva Ibarra on the one year anniversary of his death, this suitcase was used for activists to cast their ballots during the People’s Tribunal holding Sarbanand Farms to account for their unjust working conditions. From the farm, it’s another two-mile walk to the final celebration at Camp Zapata, but my friend and I are completely spent. We end up taking a shuttle back to the starting point. I’m a little disappointed not to make it all the way to the very end, but am glad to have stood witness for the tribunal at the farm. 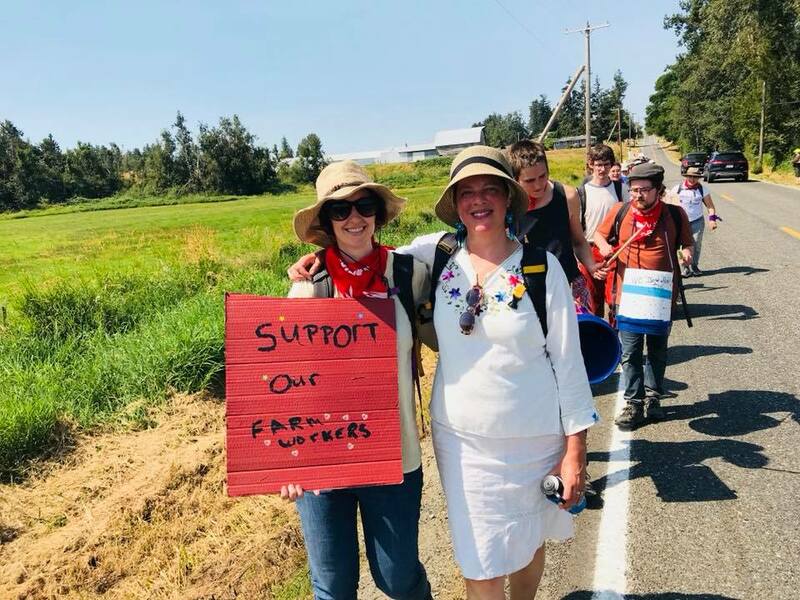 With every footfall, I have marched with the hope that someday, workers in the agriculture industry will have better occupational protections, both on paper and in practice. These abuses have been ignored for too long, but with pressure from all of us, things can begin to change. Se puede? Posted in Food Justice Blog Posts, Slider.